Shannon and her Auntie Nicole walked through the heather. They each carried a basket over their arm. Shannon’s auburn hair blew in the breeze. It was long and hung down her back, nearly to her waist. Auntie Nicole wore a scarf over her light brown hair. She didn’t like the wind to mess hers up. "When will we be there?" Shannon asked, impatiently. "Soon, Shannon. Be patient!" her aunt replied. "You said there was something at the top of the hill, something wonderful. What is it? Please tell me," Shannon pleaded. "You’ll see in a few minutes. Isn’t the heather lovely at this time of year? There’s nothing more beautiful than the hillsides of the highlands, covered with purple heather," Auntie Nicole smiled. "I think the heather looks more pink than purple this year," Shannon noted. "You’re right. It is more pinky this year. I think it depends on the way the sun shines on it. Over there," Auntie Nicole said, pointing. "It looks purple, doesn’t it?" Shannon turned to look. "Aye, it does, but right here, it looks pink." They walked up the hill slowly, stopping now and then to rest. Shannon saw a tree standing at the top. "I see a tree! Is that what you brought me up here for, to look at a tree?" "Yes," Auntie Nicole replied. "It’s not an ordinary tree though." "Oh, what kind of a tree is it then?" Shannon wondered. They reached the top of a hill. She stood and looked at the tree, examining the trunk, the branches and the leaves. "I don’t see anything special about this tree," she pouted. "Let’s eat our picnic first. You’ll see, but not until the sun is high in the sky. What did your mum pack for us today?" Auntie Nicole asked, curiously. "Let’s see," she said, reaching into her basket. "I’ve got a tomato and cucumber sandwich. She’s cut the crusts off them. How quaint!" She pulled out another bag. "Och, she’s given me a bitty sandwich. I love bitty sandwiches, even if they are cold." She opened the bread up. It was buttered on both sides with thick, crispy, golden-fried chips lying on them. "She’s sprinkled some salt on them too for me. Och, this is grand." She emptied the basket. She had a strawberry tart, a bottle of lemonade, a few chocolate fingers and a piece of broiled chicken. "What’s in your basket? I’ve got a feast here." Shannon took her bags out. "Mum gave me a ham and cheese sandwich with pickle on it. I love that. I especially love cheddar cheese. Does Uncle Daniel send you cheese from his dairy farm? He sends us a lot of it. I love cheese." "Aye, we get plenty of cheeses from Uncle Daniel," Auntie Nicole answered. "Oh look, she gave me a bag of shortbread with caramel and chocolate on top. Yummy. I’ve got some chicken flavored potato crisps and some treacle toffee too," Shannon said. "Let’s eat. The sun’s getting higher. Soon you’ll see the surprise," Auntie Nicole laughed. "This has to be our secret, Shannon. I’ve never brought anyone here before. I like to keep the little treasures for myself, but I don’t mind sharing with you, now that I’m getting bigger." They finished their picnic lunch and put all the rubbish back into their baskets. Shannon lay backwards and rested in the heather. "Look at that cloud? It’s shaped like a school bus," she giggled. "Does it look like that to you too?" Auntie Nicole looked at the cloud. "Aye, it does. I can see the driver and all the children in it too." "You cannot. You’re just teasing me," Shannon said. Just then she heard a noise coming from the tree. "What is that?" she asked. "It’s the magic," Auntie Nicole answered. "Magic? This is a magic tree?" Shannon’s mouth dropped as she watched what was happening. The leaves started to shake and shimmer. The tree seemed to be growing things from the ends of the branches. "What’s happening? Is the tree growing more leaves?" "Better than that. Follow me," Auntie Nicole said. The two of them jumped up and headed for the tree. "It only lasts about five minutes, so you have to pick as many as you can, but not too many. Don’t be greedy. This happens every day when the sun is high in the sky." "Pick what? Leaves?" Shannon asked. Auntie Nicole pulled down a branch. At the end was a blob of color. "What is it?" "Pick it off. Hurry," Auntie Nicole urged. Shannon picked it off and looked at it. "It’s a gumdrop! 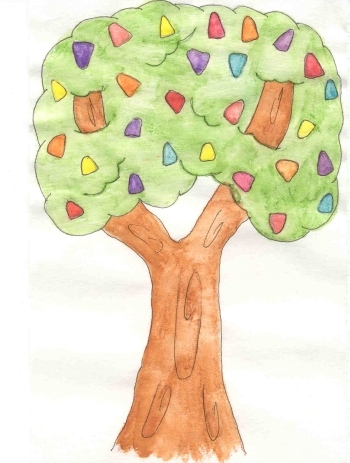 This is a magic gumdrop tree!" she laughed in delight. She picked several more, as did Auntie Nicole. A few minutes later, the tree went back to normal. "Wow! I got ten gumdrops!" She put them down on the picnic basket. "There’s a purple one. I’ll bet it tastes like grape." "Ah, but that’s another surprise. It doesn’t. It tastes like whatever you want it to taste like, as long as its something purple," Auntie Nicole said. "You mean, I can want it to taste like purple heather, and it will?" Shannon questioned. "Yes, that’s right. Once I wanted it to taste like a purple snake. It was horrid, so be careful of your choice," Auntie Nicole warned. "I think I want this purple one to taste like grapes," she said, not brave enough to choose something different. She picked up a red one. "Hmmm, I think I’d like this one to taste like a red plum." She took a bite of it. "It does. It does taste like a plum. Oh, Auntie Nicole, this is wonderful. Thank you for showing me the magic gumdrop tree." The two of them sat and nibbled on their gumdrops. Shannon ate a pink one that tasted like cotton candy, an orange one that tasted like a carrot (she didn’t like that one too much), and a blue one that tasted like blueberries. Auntie Nicole ate one or two of hers. "Don’t eat them all at once. Take them home and have some tonight, after your supper. Remember, this is our secret." Shannon put the gumdrops into her basket and they headed home. "Can we go again soon?" she asked her Auntie Nicole. "Aye, lassie. We’ll go again on Saturday. Good night," she said and left for her own house. Shannon put her other gumdrops on the table in her bedroom. Each day she ate one. She had fun trying to think up things that were different colors. The one she enjoyed the most was a yellow one that she wanted to taste like a banana. Every week, Shannon and Auntie Nicole went to the top of the hill to have a picnic and gather gumdrops. Shannon never told another soul. It was their secret.